Alzheimer’s disease is the most commonly observed neurodegenerative disorder, associated with memory loss and difficulty with cognitive functions of the body. It can be referred to, as an adverse form of dementia that can progressively get worsen due to the death or degeneration of neurons. Alzheimer is the very common form of dementia i.e. the memory loss. In 2013, on an average 6 million people were affected by the disease only in US. The CDC, has estimated 50% rise with the number of people affected by the disease over the age of 65years in every 5 years. In this regard, the expected projection of 14 million people by the end of 2025 has been put forth by many health institutions. In the younger generations, Alzheimer is found but is of very less percentage. Males are more prone to the diseased condition as compared to the females. Since the death rate of the disease is increasing, it has been ranked as the 6th leading cause of the disease in US itself. Scientists all over the world are working hard to get the clarification about the Alzheimer’s disease, known to undergo progressive brain cells failure. So far it has been cleared that the disease develops due to the complex results of multiple factors rather than any one particular cause. As of now, age and genetics play the major role in disease manifestations, although much research is needed to understand many other factors as well, which are contributing to its development. The greatest risk factor for the disease is the growing age of the person. It has been suggested that the risk of developing the disease increases or doubles up to be precise after every five years. Another possible risk factor is the family history of the disease. It has been observed that if there are Alzheimer patients in your family as brothers, sisters or parents then there is increased risk of developing the disease, through either hereditary or environmental causative factors. The studies have revealed the fact that both risk genes and deterministic genes can be present in the people with family history of the disease. There are many mentioned environmental risk factors which can be avoided such as factors that can increase the blood vessel risk including diabetes, high blood pressure, stroke which can lead to the disease. In a progressive diseases like Alzheimer’s disease, initially mild version of the symptoms are expressed, which are generally being ignored till the time they get worsen and interfere with the daily life. It is as well necessary to understand that no two Alzheimer cases are the same; their experiences with the symptoms can differ in a drastic way! Thus some of the common symptoms can be noted down as a precaution. The most typical symptom of the disease is the memory lapses with the regular intervals due to the early damage of the brain in hippocampus region, having a central role in day to day memory. Lose items around the house. Forget about the recent conversation, even, situation, etc. Get lost in the familiar places or journeys. Apart from the memory issues, some of the people with the disease may also face language difficulties, difficulty in concentration, planning as well as execution, difficulty in the orientation etc. The people with the disease may also become very moody, anxious, irritable or notably depressed. What goes wrong in Alzheimer’s disease? Alzheimer’s disease is the neurodegenerative disorder named after the scientist Alois Alzheimer; involving progressive death or damage of the neurons. 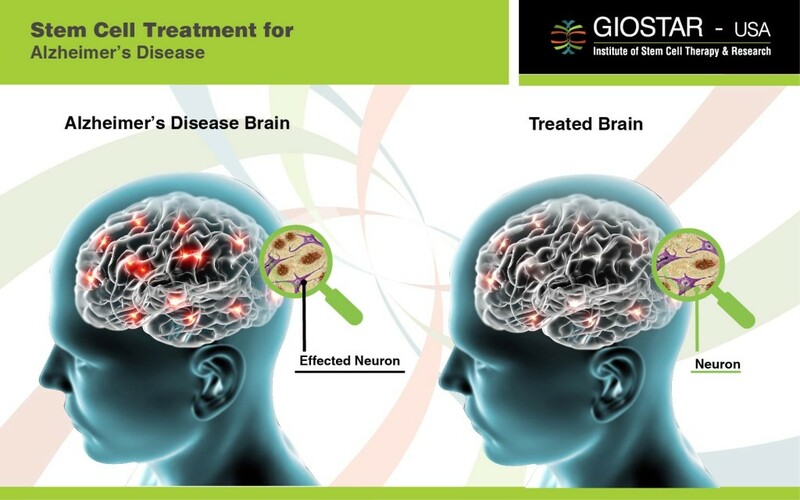 The post mortem analysis of the brain with the disease has revealed the fact that nerve tissue has many tiny inclusions of proteins known as the Plaques and tangles, which interfere with the signalling mechanism of the brain leading to the damage of brain cells. Plaques have been observed in between the dying cells of the brain from the accumulation of protein known as the Beta Amyloid proteins. There is also reported disintegration of another protein known as the tau protein, resulting in the deposition of tangles between the axonal regions of the brain cells. These depositions can delay or halt the signalling process of the brain between the brain cells. Due to loss of work, neurons may become damaged or weak. The disease may thus progressively lead to the loss of neurons leading to the shrinkage of the total brain. The loads of data accumulated from different research suggested, an evidence based differentiation of stem cells into neurons. The vasculogenetic properties of stem cells can as well lead to formation of blood vessels to improve the paracrine effect, supply of growth factors and immune cells leading to the faster recovery. Once infused back in the body, these cells can be repopulated at the damaged parts of the brain, through their strong paracrine effects and differentiate into lost or damaged neurons or other damaged supporting cells to improve motor functions of the brain. Thus with our standardized, broad based and holistic approach, it is now possible to obtain noticeable improvements in the patients with the Alzheimer’s Disease , in the symptoms as well as their functional abilities.